Conspiracy Theory of the Muslim Brothers of Sudan! How Did It Begin? The Conspiracy Theory of the Muslim Brothers of Sudan! The conspiracy theory of the Muslim Brothers of Sudan hasn't begun only in 30 June 1989, by... OK, I should interrupt here and ask, is there anybody over there who still thinks that the American administration could do anything at all to harm the regime they have built in Sudan? If you believe so, that is mere superficial. 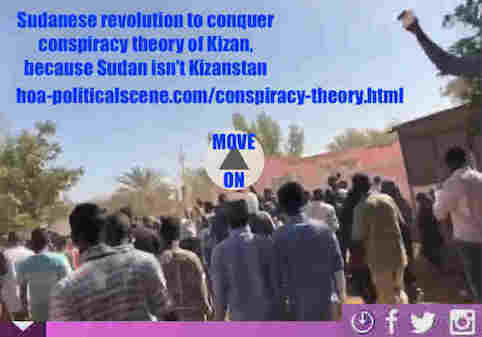 hoa-politicalscene.com/conspiracy-theory.html: The Conspiracy Theory of the Muslim Brothers of Sudan! متى بدأت نظرية التآمر للأخوان المسلمين في السودان؟ Sudanese Intifada in January 2019. To continue the leading phrase, I say the conspiracy theory of the Muslim Brothers of Sudan hasn't begun only in 30 June 1989, by the military coup they planned that date. They have achieved the coup to bring Omar al Basher to power and to build the military religious regime, which keeps abusing human rights, imprisoning, killing and torturing the Sudanese people for 30 years. The conspiracy theory of the Sudanese Muslim Brothers, has begun immediately, after the day they built this branch in Sudan during the first year in the forties of the last century, following instructions of the political and spiritual leaders of the Egyptian Muslim Brothers. We know that many branches of the so called Muslim Brothers has been established in other states in the Middle East. During that period, the Communist parties have also started to function, inspired either by the former United Soviet Socialist Republics (USSR), or the Chinese People's Socialist Republic to lead the independence struggle, to free their states from the European imperial colonizing powers. 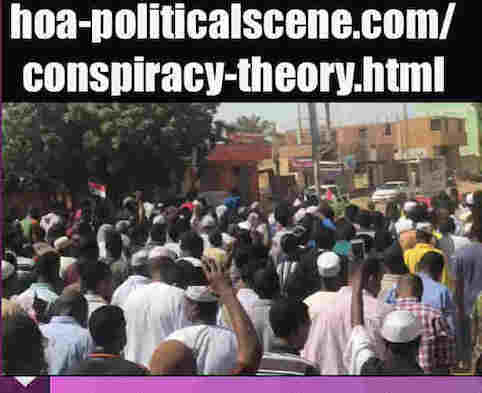 hoa-politicalscene.com/conspiracy-theory.html: The Conspiracy Theory of the Muslim Brothers of Sudan! متى بدأت نظرية المؤامرة للأخوان المسلمين في السودان؟ Sudanese people revolution in January 2019. When Did the Conspiracy Theory of the Muslim Brothers of Sudan Begin? Until the second World War, America wasn't involved directly in world's affairs. But, the American administration has found a way to interfere indirectly by supporting the wings of the Muslim Brothers, in every state in the Middle East to disrupt the growth of the communist parties and eliminate the communist parties. That goal was not easy to achieve during that period, if the American administration did not properly read the demographic map of the Middle East, to decide upon the best policy to follow to dismantle the communist parties from their grassroots. It was not important to have Christians in this region, especially in areas that consist of Muslim majorities. A large part of the Christians, by virtue of their enlightenment, were closer to belonging to the Communist parties in the region. In fact, some of them had the virtue of founding communist parties in the area. 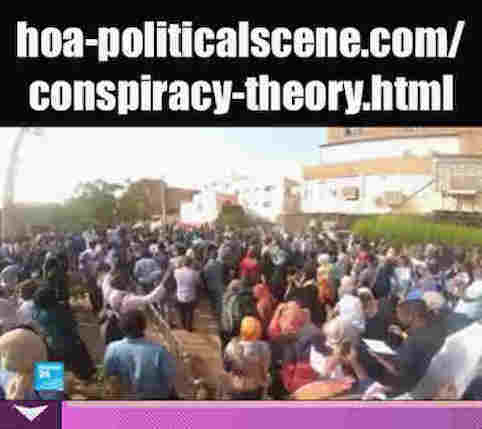 hoa-politicalscene.com/conspiracy-theory.html: The Conspiracy Theory of the Muslim Brothers of Sudan! متى بدأت نظرية التآمر للأخوان المسلمين في السودان؟ Sudanese people protests in January 2019. So, that was the indication of why the American administration that time had favoured and partnered with the majorities of the Muslim Brothers, especially in Sudan, the most biggest land in Africa, which contains most of the world natural treasures. 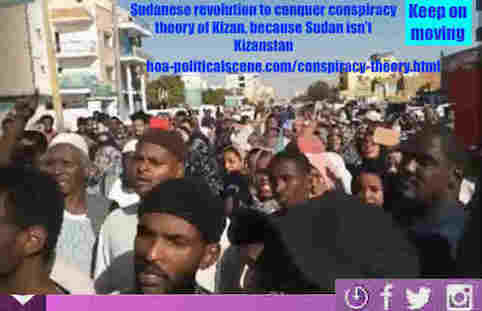 However, the Muslim Brothers of Sudan have recently learned a lot from the international conspiracy theory and from "Pawns in the Game" by William Guy Carr, to form the full conspiracy theory and implement it in Sudan. To fulfill their political game, they used the policy I called the "The Muslim Brotherhood's policy of burning the political stages to continue in power in Sudan". 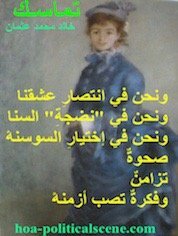 See in Arabic "سياسة حرق المراحل السياسية لاستمرار الأخوان المسلمين في السلطة في السودان". They did that using also what I described as a policy of the octopus arms of the Muslim Brotherhood in Sudan. See in English "Muslim Brothers' Octopus in Sudan". 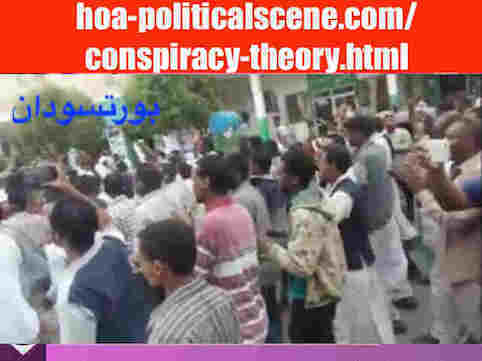 hoa-politicalscene.com/conspiracy-theory.html: The Conspiracy Theory of the Muslim Brothers of Sudan! متى بدأت نظرية المؤامرة للأخوان المسلمين في السودان؟ Sudanese people uprising in January 2019. According to what I have called, or described more than thirty years ago, they used these methods to wash the minds of the Sudanese, to foster the absence of Sudanese mentality and to keep the Sudanese mentality very weak, and even blind to see their conspiracy theory. See in Arabic "تغييب الذاكرة يؤدي الي تفريغ المظاهرات". They have found in similar traditional Sudanese parties their aim to implement the policy of marginalizing the Sudanese mentality‫.‬ See in Arabic "تغييب الذهنية السودانية". 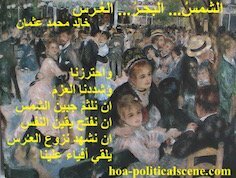 They did so by virtue of the fact that these Sudanese political parties are, in effect, Muslim parties, and right-wing parties like them, and have the same agendas and interests, as the Muslim Brotherhood in rooting out the Sudanese people for leadership and wealth. See in Arabic "سياسة الاخطبوط السودانية وتعطيل حركة التاريخ". 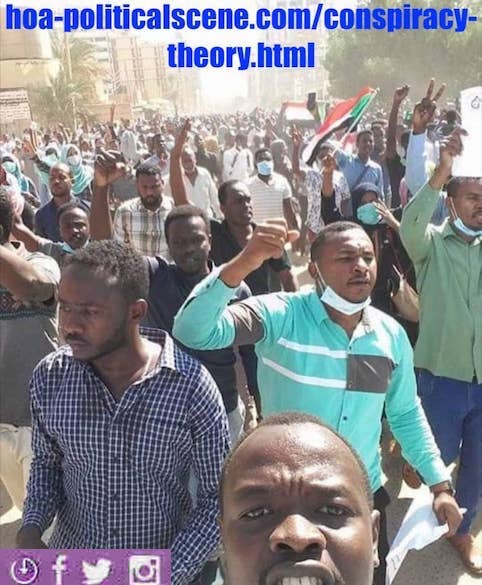 So, for a long time, I have been working as a journalist and expert on the Horn of Africa's political affairs, saying that the Sudanese Muslim Brotherhood, through various political eras, has been able to use and exploit the Sudanese sectarian parties to serve their interests, and they have burned them in the policy of burning the political stages in the Sudan. 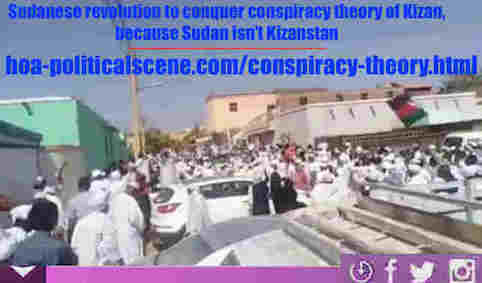 hoa-politicalscene.com/conspiracy-theory.html: The Conspiracy Theory of the Muslim Brothers of Sudan! متى بدأت نظرية المؤامرة للأخوان المسلمين في السودان؟ Sudanese Intifada in January 2019. Think of the Conspiracy Theory of the Muslim Brothers of Sudan Wisely! If you don't have eyes, you can't see this, or understand it. Get your instinct on to think right of all that has happened in Sudan. Not only that, but, take the word from one who has been there and still watching the political development, not only in Sudan, but in the entire Horn of Africa and East Africa. BEE STRATEGIC THINKER. It is not worse than these results to strengthen the alienation of sectarian parties and break down their wings, to empower the regime of Omar al-Bashir, but to pave the way for the separation of the South Sudan. That's because of the fact that, South Sudan has always been a concern for all right-wing parties, and especially to the Muslim Brothers in their empowerment project, and their project to implement Islamic sharia. Their regime did so through the so-called Comprehensive Peace Agreement, which was nothing more than a comprehensive fragmentation agreement. The agreement has already confused the minds of the Sudanese people (See in English "Comprehensive Peace Agreement Perplexed Sudanese"), and paved the way to the referendum in southern Sudan, with a fundamentally illegitimate regime. The regime then began the rest of its project in beating Darfur and the Nuba Mountains further, using its jihadist militias, which committed massacres, caused the Darfur crisis, resorted to dismantling the Sudan, selling its fertile land, first investment projects and other strategic sites. Since the early days of the totalitarian regime brough by the organization of the so-called Islamic Nationalist front (NIF), one of the political wings created by the Muslim Brotherhood in the Sudan, the Sudanese people have been organizing demonstrations against the total injustice of the military religious regime. But, this dictatorial system, which was established and enabled by the Islamic Nationalist front and headed since its first day by Omar al-Bashir, continued to practice various kinds of violence. It still takes all arbitrary measures to restrain the people, throughout 30 years of a terror policy, using an army full of security apparatus and its jihadist militias. 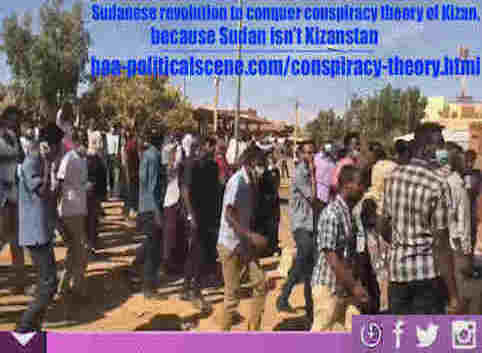 hoa-politicalscene.com/conspiracy-theory.html: The Conspiracy Theory of the Muslim Brothers of Sudan! متى بدأت نظرية المؤامرة للأخوان المسلمين في السودان؟ Sudanese people protests in January 2019. 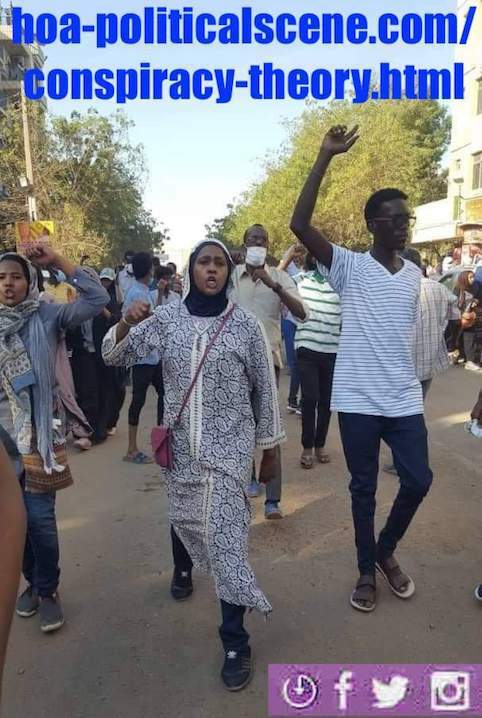 Meanwhile, the Sudanese demonstrators continued to organize peaceful demonstrations, demanding their fundamental rights, which the totalitarian regime violates every day. During these 30 years, nothing has changed. The peaceful demonstrations did not accomplish anything, yet protesters claiming their legitimate rights continued to be beaten, arrested, tortured and shot dead. All these brutal repressive tactics by the regime's security apparatus are intended to deter protesters from protesting to stop the injustice of a totalitarian regime and the Muslim Brothers' conspiracy theory. We have achieved nothing out of our hard social activities in the social media too. We have achieved nothing also from our human rights activities, and where we have, on every occasion in which the people are demonstrating and repressed, submitted criminal pleadings to Amnesty International and other human rights organizations. We also submitted human rights violations in Sudan to the International Criminal Court (ICC), which has already issued the arrest warrant of Omer al basher many years ago, to bring its attention to the reality of the political situation in the Sudan. See "Arrest Sudanese Dictator". We did that also to get it the facts that the genocide wasn't only in Darfur, but even all over the country, as many areas face the same fate. The ICC couldn't do anything. Who's there you think control the ICC? Could that explain anything to you, at all? We saw part of the conspiracy theory through the Brotherhood-split game of the late 1990s, a fundamental political game practiced by the Muslim Brothers party to sow ashes in eyes. 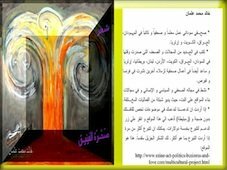 The party exercises this in accordance with their theory of burning the political stages in the Sudan. The party did that also according to their planning to create octopus arms, based on the demand of each stage. We saw how they became a National Congress party and a People's Conference party. So, everything we understand after all of this is obvious. We are in front of a satanic political party. This party is based on psychopathic leadership. 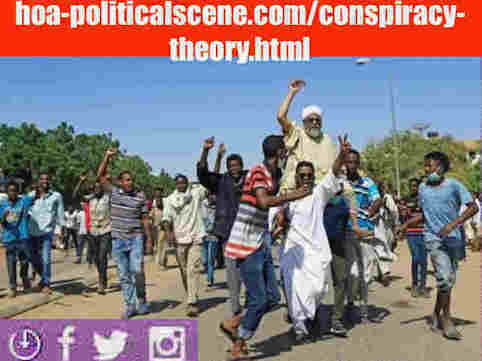 How to Get Rid of the Conspiracy Theory of the Muslim Brothers of Sudan? We have failed. We still fail since 1989 to bring the totalitarian regime down. We still keep saying peacefully, peacefully. How could oppression of 30 years have not driven us nut, to become Sudanese tigers, so we could beat those criminals to death? We don't want to beat them only, but, we want also to attract many sharks to the Red Sea, so they can take them all at dinner. Keep in mind, since all of the hard efforts of demonstrations have failed through the long years, we should take a break to think twice about doing something else. Take all of the same hard efforts we have taken in a different way, or maybe in a multiple ways. That means to upgrade the demonstrations and all of the efforts made to achieve the demonstrations. We have all of the tools we used to achieve continuous demonstrations in Sudan. So, take all of the tools and upgrade them to a higher level of revolution. Begin by sorting carefully the manpower we used to demonstrate against the totalitarian regime. Organize the outcome of sorting the manpower in lists. Start contacting every list from the tip of the pyramid level to the base of the pyramid. We do that to look for those active people in the manpower lists who could think with us on how to upgrade the level of the revolution from only demonstrating to the higher level of the revolution. Keep discussing with them how to do that until we come to the point of making every Sudanese individual a Sudanese Tiger. See ANNUMOR ALSUDANYAH. Well, there are many plans towards achieving this revolutionary organization and I should stop at this level, so no one of the political powers, who are empty of ideas there to steal it. If you want the rest of the grassroots of the organization plans, contact Annmor AlSudanyah to have the way-plan, as revolutionary tools, so that way you be a Sudanese Tiger. This is the only way to conquer the conspiracy theory of the muslim Brothers in Sudan. 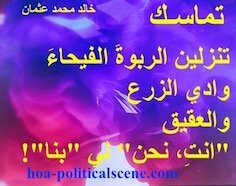 This is how I, the Sudanese journalist Khaled Mohamed Osman has spoken, more than thirty years ago about the correct alphabets of revolutionary work, derived from the experience of the failure of the April 1985 uprising. So, it is very true that the proper body is accomplished first by the proper mind, and prior to any other action on Earth, such as popular demonstrations. That's because only through a proper mind can the body of the revolution be intact. In order for the body of the revolution to be intact, the revolutionary road map must be pursued in partnership with the Sudanese Tigers Group. 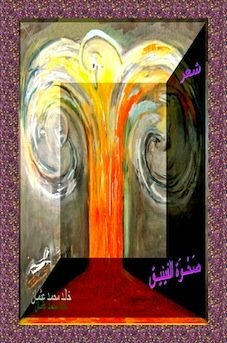 Once more and for Arabic readers read the Arabic version at the Muslim Brothers Conspiracy Theory. Be active to share and share your point of view. It takes you only five mintures. See how the Muslim Brothers conspiracy theory, which has been implemented by the totalitarian regime has destroyed many Sudanese regions. including the treasury source Kordofan. You might find documentaries about this consiracy theroy at the TVCinemaAPP.com. Use the following comments form below to comment on the conspiracy theory of the Muslim Brothers in Sudan. Your comment will be added to the comment C2 entries on the Horn Africas Network.